Amanda Finn grew up in Mason Ohio just north of Cincinnati where she lived until her final year of high school. Just before starting her senior year, her parents moved the family to Oklahoma. That year proved to be a challenging time in 17 year old Finn’s life, which she managed to survive after realizing she was not required to ride a horse or live in a teepee (original dramatic thought of a 17 year old). She then moved on to attend Lindenwood University just outside of St. Louis, Missouri and graduated with Bachelor of Arts degree in Marketing. Immediately after school she started working for a local marketing research firm in St. Louis focusing on internal marketing and social media. This was a good role for a recent college graduate, where she remained for three years developing marketing strategies for major Midwestern clients. With her parents move to Marietta, Ohio, a visit home sparked a change in career path that she was looking for. Finn met a local Ohio congressman and, after shadowing his D.C. fundraiser staffer, she was offered a position to move back to Ohio and start working as his director of finance. This opened the door to the state’s energy industry as Finn was meeting numerous people directly involved in oil and gas. In her fundraising role, Finn met the CEO of Magnum Hunter Resources Corporation, who presented an opportunity for Finn to leave the fundraising side of politics and make the leap over to government relations and community affairs. Having built a network in oil and gas while doing congressional fundraising, Finn felt ready to make this career shift. For the next two years, Finn was the Government Relations Manager for Magnum Hunter. During this time, she also focused on community relations and public relations throughout Ohio and West Virginia. During the oil and gas industry’s bust of 2016, Magnum Hunter filed for bankruptcy, in turn causing staff turnover. Finn then went on to Ascent Resources – Utica, LLC (“Ascent”) where she currently works as their Government Relations Manager. Finn’s role at Ascent involves a variety of focuses, but a key piece is government relations. The job, which includes working individually and with OOGA involves educating and working with members of the General Assembly on key pieces of legislation, rules and regulations through the Ohio Department of Natural Resources (ODNR) and all aspects of community relations. This includes working with local township trustees, commissioners or mayors, along with land owner relations, mainly updating them on activities in the area and fielding any issues or complaints. Ascent is headquartered in Oklahoma City, Oklahoma with about 240 employees based in that office; Finn works in the Cambridge field-office that has over 100 employees and is the largest office outside of the headquarters. In Ohio there is one other small office in St. Clairsville that focuses on Ascent’s dry gas operations. Finn described that Ascent hires primarily local contractors, with at least 80% of them coming from the tri-state region in Ohio, West Virginia and Pennsylvania. 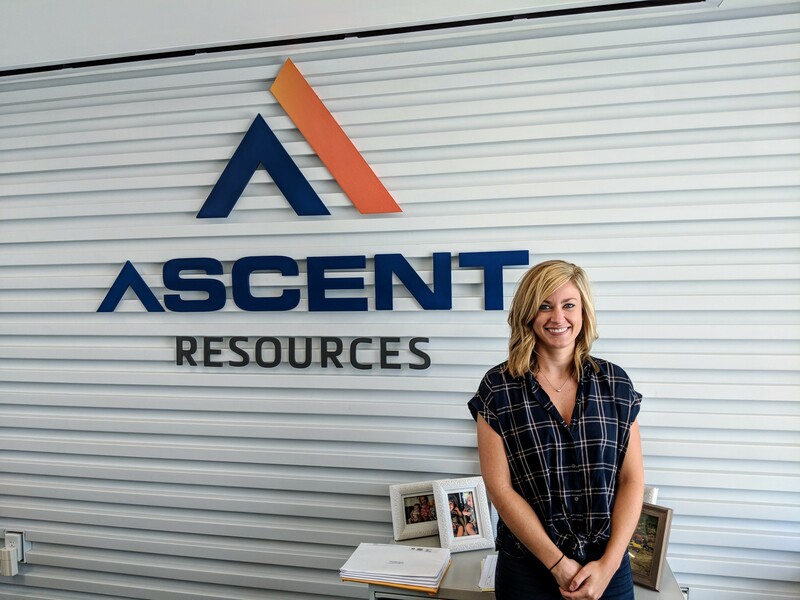 Ascent is operating strongly in four Ohio counties that include Belmont, Harrison, Guernsey and Jefferson, and its recent acquisition of natural gas assets from CNX, Hess and UMD will expand its acreage position in Monroe and Noble Counties. Across these counties they have seven rigs running and four frac crews. Being the largest gas producer in Ohio, Ascent has nine of the top ten gas wells in the state according to the latest production figures released for Q1 of 2018. Finn initially became a member of the Ohio Oil and Gas Association in 2013 while she was in her fundraising role. When she started working at Magnum Hunter, one of the first things she did was make sure the company became more involved with the Association. She also stepped up her personal level of participation by joining the Government Affairs Committee and the Environmental Committee, later becoming chair of the Government Affairs Committee in 2016. Finn carried this same attitude over to Ascent when she started her new position. Ascent upped its membership to the highest corporate level in order to get a wider reach of its staff members involved with the OOGA. They now have at least one employee on each committee that OOGA has available. Finn continues to chair the Government Affairs Committee and has expanded her involvement to include a Board of Trustees seat in 2017 and was recently appointed to the Executive Committee in 2018. She remains involved in other committees to keep Ascent up to speed on what is happening in the industry, and sits on the Environmental Committee, Communications Committee, Technical Committee and other work groups when necessary.